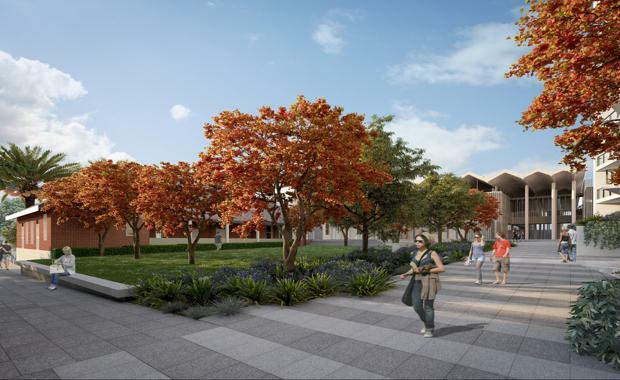 Mirvac’s planned redevelopment of the former Marrickville Hospital site into the Marrickville Community Hub is the first project of its size and density in Australia to register under the One Planet Communities program. Provided by Bioregional Australia, The One Planet Living international framework goes beyond typical environmental sustainability outcomes to include sustainable principles that contribute social capital such as health and happiness, local and sustainable food, culture and community, equity and local economy, education and engagement. Mirvac Head of Residential John Carfi said the Marrickville redevelopment has a strong and engaged local community, including provision of a new public library, public open spaces, retention and re-use of existing heritage buildings, a community garden and around 225 apartments“By applying the One Planet Living principles to the development we aim to create a place that embraces the community and advances Mirvac’s This Changes Everything sustainability plan," said Mr Carfi. “As developers we have a responsibility to ensure that the places we create make a positive contribution to the people who live there and the communities around them. Bioregional Australia was established in the UK in 1994, with One Planet Living released in 2004 to provide a framework for a more sustainable way to live, work and do business. Its goal is a world where it is easy, attractive and affordable for people to lead healthy and happy lives within a fair share of the earth’s resources. Bioregional Australia Foundation Executive Director Suzette Jackson said the Marrickville project presented an ideal opportunity to provide a real benefit to the wider community. “This is a fantastic project that will test the application of One Planet Living in the Sydney market,” said Ms Jackson. “It is a very important site to the residents of the inner-west and with development of a community hub there will be a contribution back to the community. Mr Carfi said that Mirvac plans to continue progress towards its sustainability plan 'This Changes Everything’ by setting corporate targets of zero carbon emissions, zero waste and using sustainable materials throughout its supply chain. Achieving a One Planet project is a key element of Mirvac’s Plan for 2016. “If everybody in the world lived like us we would need 3.7 planets to sustain us,"said Mr Carfi. "Clearly we have only one planet so we must take all necessary steps to reduce our footprint and look at sustainability in a more holistic way."